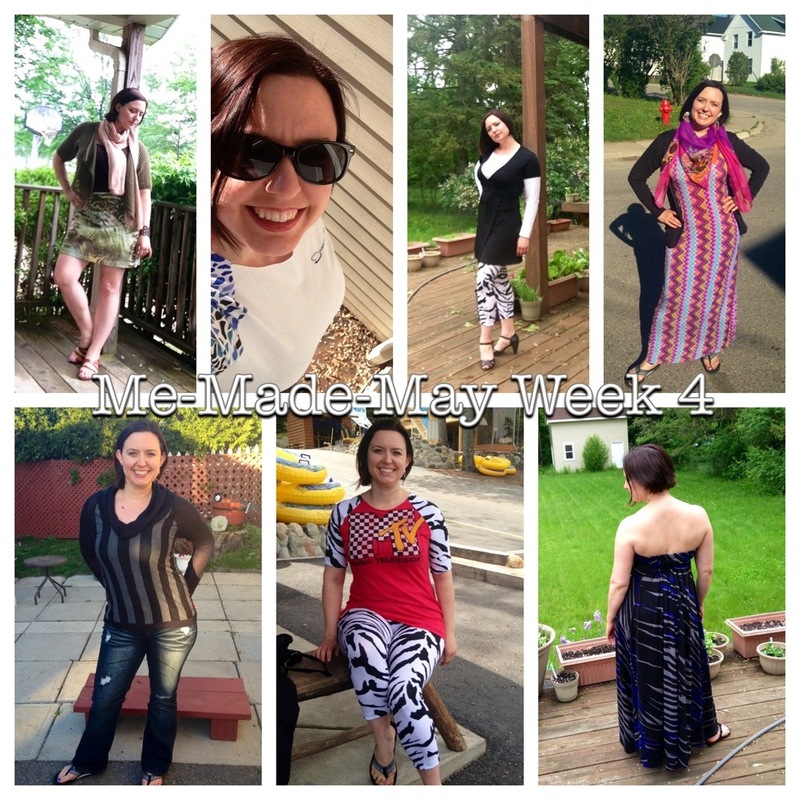 So here it is, halfway through the first week in June, and I’m finally writing my Me-Made-May wrap-up post. Overall, it was a success. I did wear me-made items every day and photograph it every day. It was an interesting experiment to see what I wear in my wardrobe. But I found myself struggling toward the end to not repeat loved items and to always incorporate something into my daily outfit. I won’t say that’s because I have a hole to fill; it’s that it’s previously been filled by RTW garments. 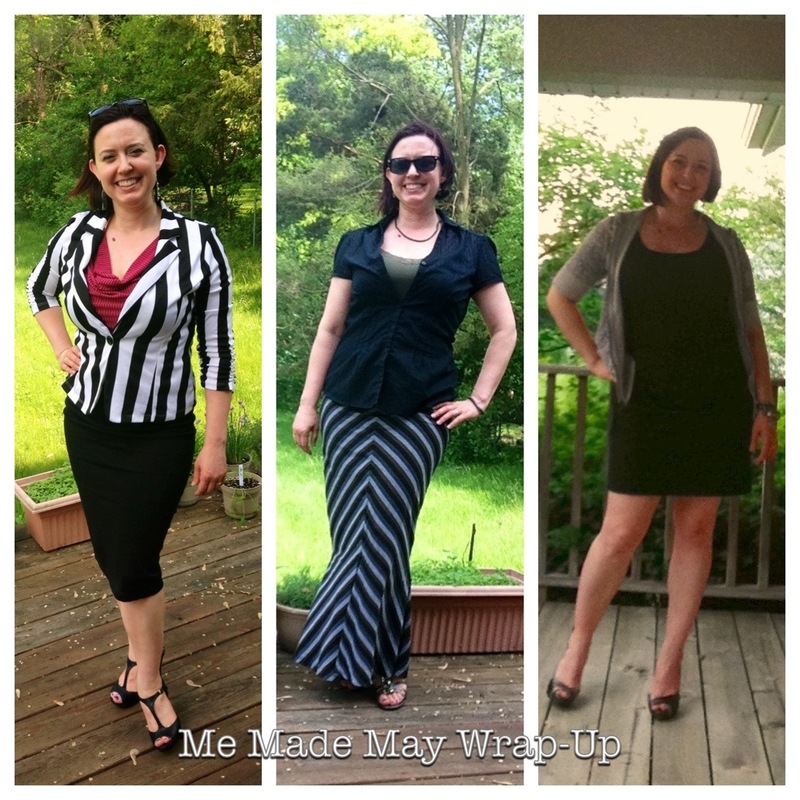 There’s a few combinations (including an adorable spring skirt I picked up at a clothing swap) that I wanted to wear but couldn’t because it would all be RTW. Today’s outfit is a perfect example: tee, cardigan and cute spring skirt. The skirt (not made by me) is the focal point and I don’t see any particular need to sew up a tee or cardi just to wear something I made. That said, I loved the response I’ve gotten from my friends and family. I don’t think most people realized how much I sew. (Which makes me a little proud because that means it doesn’t look too home-becky-ecky). I did not accomplish all my goals. I didn’t finish my denim blazer. Partly, because I was so busy that I sewed in fits and spurts, making it hard for me to concentrate on a big project like the blazer. And partly I didn’t finish because I worked on some other, smaller projects that also filled some gaps in my wardrobe. So I still consider this a win. 22. stretch woven skirt, Built by Wendy Sew U. It’s a little loose but I’ve never gotten around to taking it in. Very simple a-line skirt. 24. (yes, I have them out of order in the photo. Whoops). Refashioned work tee, Built by Wendy Sew U Home Stretch raglan tee. This was a big hit at the office; everyone loved how I rebuilt the tee shirt into something a little more interesting. 23. Zebra print lycra leggings, McCall’s 6404. I wasn’t too sure I’d like these crazy pants when I made them (but knew a friend that would adore them if I didn’t wear them). I think I kinda like them. I have one more set to debut here but didn’t manage to get it styled right. 25. Missoni-esque print jersey maxi dress, McCall’s 6559. Not seen: plain black leggings from McCall’s 6404. We were Up North for the weekend, so temps were a bit cooler. A lot of layering going on here. LOL. I desperately need to take the shoulders up in this dress (and it’s solid counterpart). Currently, I have to wear a tank top underneath to keep it decent. 26. Vogue 8634 in mixed sweater knits. I love this pattern and have two tunic-length versions in my closet. I finally cut the top-length but found it just a little short for my liking. I added the contrast band to the bottom–a happy design feature that really completes the top. 27. Refashioned tee from Built by Wendy Sew U Home Stretch raglan tee + zebra leggings McCall’s 6404. I just had to wear the two together, since the sleeves on the tee are the scraps from the leggings. LOL. Since that day all I did was drive home 5 hrs and go to dance rehearsal, it was a perfect day for a crazy outfit. 28. Refashioned strapless dress. This dress was originally 2x (4x?) from Target. I loved the style, print and fabric but there weren’t any dresses left in my size (it was clearanced). I pulled off the bodice (to shorten it), ripped out the back elastic and inserted an extra row of casing, stitched everything together and inserted elastic. What you see gathered in back is the entire original back. The original from wraps about 60% of the way around. 29. Cowl tank (McCall’s 6078). This is my first iteration on this tank and as such lacks the narrow upper back adjustment I made on subsequent versions. It’s wearable, but really only with a jacket. (Speaking of jackets: how awesome is that striped number? I picked it up for a song while out shopping the weekend prior. I’m a sucker for black and white stripes). 30. Self-drafted 4-gore mermaid skirt in mystery jersey. This is the same pattern as the awesome black and white striped number, but far less successful. Mostly, I think it’s the jersey. It isn’t quite beefy enough for the skirt and I’ve never gotten the waist elastic fit right so it always feels like it’s falling down. I have one more save to try on the waist and then I’m chucking it. 31. Black stretch woven Vogue 8603 with self-drafted pockets. Last day! This is what I wore to see David play. I love my pockets. I tried styling it with another top I have never worn but, in the 5 minutes I had to get ready, I couldn’t quite make it work. I grabbed this RTW short-sleeve hoodie instead. I’m glad I did as it ended up quite chilly in the bar that night.